Ok, with a headline like this, I took a double take on what I was reading. The Financial Services Royal Commission continues. One Commonwealth Bank financial adviser was found charging fees to a client who died more than a decade ago. Sounds incredulous but it actually happened. So the question is how and why did this happen? Was this not intended or fraud? Would tighter policies to govern behaviour be the answer to preventing fraud? Would fines and reduction of remuneration benefits curb unwanted behaviours? Would processes need to be fixed to prevent such errors? There is no easy answer for large organisations that risk losing control over staff and daily business activities. The Moments of Truth (MOT) for customers in this case have turned into miserable experiences. What are Moments of Truth (MOT)? The trust and purpose for MOT are destroyed for customers when organisations do them wrong. An organisation is an eco-system that delivers experiences to customers everyday. It can be positive or negative experiences. Think about certain organisations where you would dread calling the contact centre because of the experience you’ve had in the past. But what if customer experiences could be transformed, not from an ‘inside-out’ approach, but from an ‘outside-in’ perspective. Global thought leader, BP Group founder, Steve Towers wrote a book called ‘Outside-In: The Secret of the 21st Century Leading Companies’. He says that customer-centricity is not new but how we look at customer-centricity to drive ‘successful customer outcomes’ in all business and customer interactions can shape the transformation from within. It’s about stepping into the shoes of the customers and anticipating the customer’s true need, not just the perceived want. That drives how the business will be organised from tasks, activities, outputs to outcome impacting the customers positively. It’s about looking the ‘cradle to grave’ customer engagement but from the customer’s view. The inside-out approach may be “doing things right” but not necessarily “doing the right things”. An outside-in process is one which has been created to successfully deliver a customer outcome and has been OUTSIDE designed from the customer’s perspective. This process is likely to reduce the number of MOTs or interactions with the organisation and focus on “doing the right things”, in terms of delivering the process as part of an overall customer success strategy. An inside-out process may be thought of as one which also provides the goods or services to the customer, but the process to provide these are viewed from the organisation’s perspective. It may be “doing things right” but not necessarily “doing the right things”. It may seek to improve the customer’s experience, but not necessarily aligned with delivering a successful customer outcome, or what the customer really wants. A customer centric journey must be developed holistically and take a whole of business approach from strategic development and alignment; customer insights; experience design; human behaviour, motivation and performance; Centre of Excellence; and metrics. Steve has worked with many blue-chip organisations. He has come across many organisations that claim they are customer-focused, but most fail to really put themselves in their customers’ shoes and deliver real solutions for their customers’. The time to step to into the customers’ shoes is now. It will define the business landscape and set competitors apart simply because they could anticipate the needs and wants of the customers. Balancing their business and customer objectives. In the coming months, IQ Group will be bringing certified Customer Experience Management (CEMMethod™) courses developed by the BP Group as part of its new learning services division, HIQ Learning Services. The CEMMethod™courses rapidly uncovers design improvements that enhances customer experiences using collaborative, adaptive and innovative methods that help organisations to be agile in change and sustaining growth. For more enquiries about our learning services, please contact hiqls@iqgroup.com.au, or visit www.iqgroup.com.au/hiqls. I like checking out bookstores in airports when I’m waiting to board. So, when I came across the Harvard Business Review (HBR) magazine featuring a picture of a slinky and a big bold title that read ‘Agile At Scale: How To Create a Truly Flexible Organization’, I had to buy it. It’s a great read and further validates why we curated the unique learning course ‘Hacking for agile change’, developed by Lena Ross of changehacks based on her book with the same name, as one of our intent-driven learning course offerings by HIQ Learning Services. De-mystifying the word ‘agile’ is still needed in a complex world. With fast-moving, globalised competitors and start-ups threatening the big players, creating agile innovation teams and scaling is essential to survive and maintain market leadership. One shudders at the thought of big brands like Kodak or Nokia which dominated our lives once upon a time. Now these brands are talked about as case studies for not innovating which caused their demise. No organisation is immune to change. The HBR article talked about using agile values to innovate quickly. I found that interesting as we often hear the term ‘Agile’ (with the big ‘A’) as a ‘practice’ or ‘methodology’ for project delivery and software development, while ‘agile’ (the little ‘a’) is about a ‘mindset change’ to apply creativity to improve products, services, processes or business models and staying focused on the business and customer outcomes. They stay close to the customers, internal and external, are focused on a specific outcome, autonomous, creative, self-governing and possess cross-capability. They are empowered by leaders who practice hands-off leadership, but know when to step in to remove barriers and spot constraints to help agile teams to innovate. Their leaders embrace agile values and ensure that the non-agile teams within the business also provide a supportive stance to create a ‘frictionless’ experience for agile teams. The article compared the approaches on scaling agile; Big-bang vs Sequenced. Big-bang transitions refer to significant overnight changes by radically removing traditional hierarchies and replacing these with hundreds of agile teams. Imagine the profound change of mindsets require to execute big-bang transitions. It would have required a significant number of agile practitioners to coach people through the change. Sequenced approach is much gentler in introducing agile teams, a handful at a time, matched to an implementation need to build agile capability over time. Changing mindset takes time and requires ongoing coaching, a lot of empathy and reflection to seal it. I liked the final story in the HBR article which talked about using the agile approach for space colonisation. SpaceX is an ambitious project which uses the agile mindset to begin transporting people to Mars by 2024 to establish a self-sustaining colony, a literal sci-fi dream come true. SpaceX does not have all the answers yet, but they do have the resources and access to push technology as far as possible until new technologies and partners are created in future. Achieving this requires high agility and adaptability made possible by the agile mindset. When the little ‘a’ in agile is implemented well, organisations can profoundly succeed, stay ahead of the competitive curve rather than playing catch-up and merely surviving. 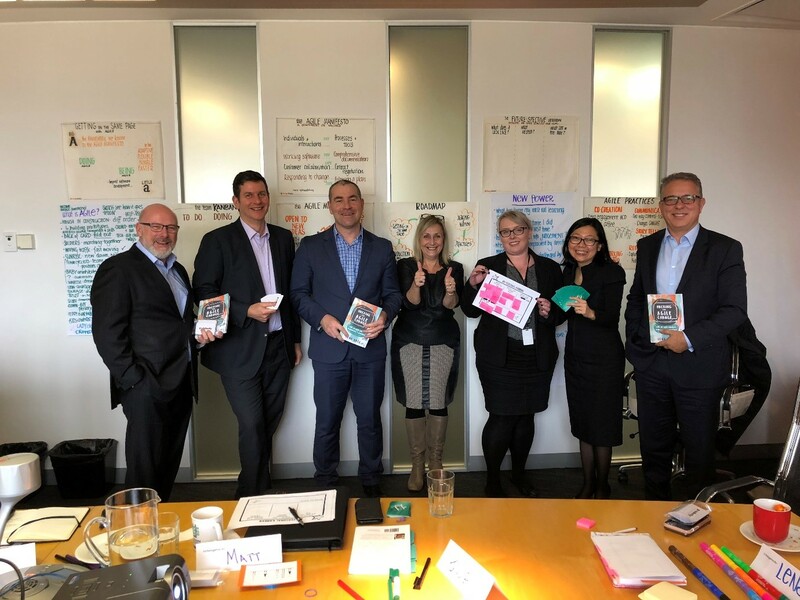 At IQ Group Australia, we had a launch session of the ‘Hacking for agile change’ course and came away with an array of agile change hacks that we can immediately use to start changing our mindsets. To learn more about mindset, behaviours and practices, the little ‘a’ in agile, enrol in our upcoming public course, a choice of half-day or full day workshops on ‘Hacking for agile change’. To enquire about how you can bring ‘Hacking for agile change’ course to your organisation, please contact hiqls@iqgroup.com.au. Where do you Start When Everything in Super is Changing? There’s a record number of ideas swirling around for changes to superannuation. There are a lot of problems to be fixed and a lot of good ideas about how to fix them. But how do you plan a program of change when there is so much going on, and so little certainty about how it’s all going to end up? If it’s this confusing for the super industry, spare a thought for the poor consumer. There’s lots of legislation before the Australian Parliament, the Productivity Commission has a long shopping list of superannuation issues, and the Government issues new proposals for change on a regular basis. Let’s just drill down on insurance in super as an example and think about how to best respond. The super industry has issued an insurance code of practice and is working with funds to encourage its adoption. A parliamentary committee has handed down a host of recommendations about life insurance, including super in insurance, but didn’t think the code went far enough. The Productivity Commission has made a series of insurance recommendations in its voluminous superannuation report, including that the code didn’t go far enough. ASIC and APRA are working on a claims data project, but both have publicly concluded that the code didn’t go far enough. The Government announced changes to insurance in super in the Federal Budget and have released legislation to make this happen – because they don’t think the insurance code went far enough and they don’t think that young and casually employed consumers are getting a fair deal. Now, unfortunately, not all these proposals are the same and some of them are inconsistent. Some parts of Government want to replace the code with legislation, while others want the code to be mandatory. This places super funds who want to implement changes to improve things for members in something of a quandary. What to do next? The answer is, you concentrate on those changes that have certainty and specificity about them, and don’t let yourself be distracted by people running ideas up the flagpole to see if anybody salutes them. They might be good ideas but that’s what the Productivity Commission, for one, is doing. It will be much later this year before the Commission hands down its final report, and probably next year before the Government responds. They might respond to some, all or none of the Commission’s recommendations. The world is full of Productivity Commission ideas that are gathering dust. Even if the Government does proceed, who knows what will happen in the byzantine world of Federal Parliament – especially the unruly Senate. The same goes for the Budget changes and the parliamentary committee recommendations. On the other hand, super funds are putting together transition plans for the insurance code and are working with insurers and administrators on how to make change happen. These will be in place by the end of the year, and some funds are even moving forward much faster. There’s a lot of work involved in implementing the code. It will be complicated and expensive, but it will also be comprehensive and directly lead to better member outcomes. The smart money is on this process being the one that will actually lead to the biggest, best and most sustained outcomes. Funds developing a comprehensive program of work for the insurance code, cross-referencing the myriad requirements, who have a clear roadmap for moving forward and who are not distracted by the latest headline or Government announcement are going to be the winners here. Our world has been revolutionised by technological advancements. Think about it. We now carry the internet in the palm of our hands. The smartphone. With the introduction of the iPhone about 11 years ago, this little device forever changed how we live and interact with each other. Steve Jobs and the Apple team combined the computer, music player and phone all in one product. When the iPod first came out more than 17 years ago, the world was so excited at the prospect of shuffling songs with thumb strokes. Now more and more brands are developing smart phones with all sorts of functionality, shapes and colours. So, what’s next? There has been a lot of talk around the globe about Voice Activated Virtual Assistants. The big tech heavyweights are racing to the top to make their Virtual Assistants sophisticated and more human-like to fulfil our needs accurately, and in some cases, anticipating our needs before we thought we need it. Apple has Siri, Amazon has Alexa, Google has Google Assistant and Microsoft has Cortana. I later exited the website and went about doing other work. Within an hour, I was shocked to receive a Facebook Messenger message from the ChatBot with the answer to my question. Immediately I thought, “How did the Fund website know to contact me on Messenger?”. I felt stalked. Then I realised that I’ve logged in using Google which connected all the different apps with one login, including Messenger. Still rather unnerving from a customer experience perspective where our data is used in ways we are not expecting. I heard at a conference a term used ‘frictionless customer experience.’ It’s defined as ‘a mindset of business that pursues continuously the right product to customers at the right moment and in the right channel.’ It’s about removing the grit, the hassles and thinking through how different customer segments will react or respond to the change. It’s a concept about anticipation. So if I took the scenario of my interaction with the Fund ChatBot, I guess I would have liked the ChatBot to ask me whether they would like to email the answer once it has the answer so it would have appeared they got my details with my permission. That would have removed the grit of feeling my privacy was invaded. Always ask ‘What’s the problem you are trying to solve for customers?’. Research, prototype, test, test, test and validate. Get the end users to drive the learning of this technology. Understand the customer lifecycle first. Technology second. What has been your experience with Virtual Assistants? Share with us. We’re listening. To learn more about how improving on the customer experience can help you in your business, check out our Customer Experience Management courses. Set your brand apart from your competitors, win the affection, loyalty and trust of your customers, and build your organisation’s eco-system – consisting of people, process and technology – in a way to work holistically and deliver memorable customers’ experiences. Read More.